Install this module with Magento 2 Simple Details on Grouped Product extension to have a perfect combo to improve your Grouped product significantly! 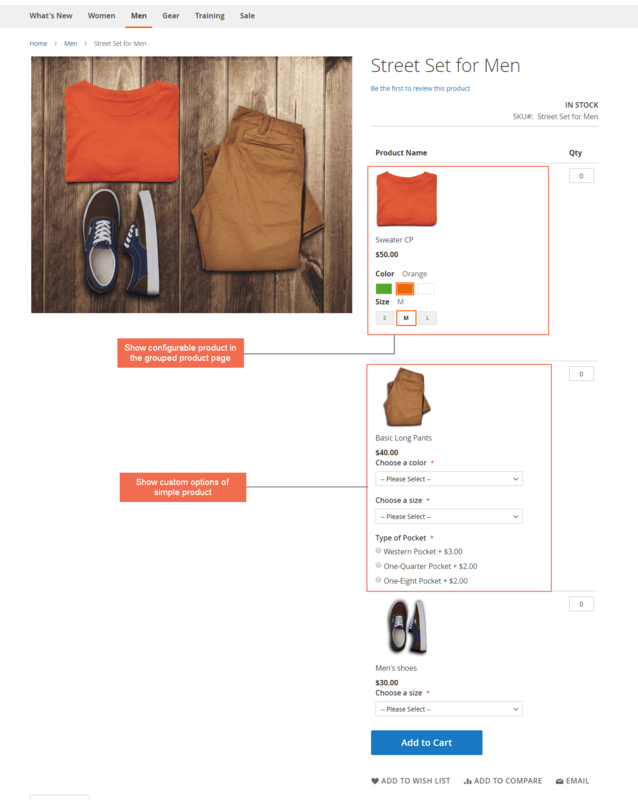 In order to improve product custom options, you can install Magento 2 Custom Option Template extension to create custom options templates to add to multiple products, Magento 2 Custom Option Image extension to add images to custom options, and Magento 2 Custom Option Absolute Price and Quantity extension to get the flexible price calculation and apply custom option quantity. All custom options of simple products and configurable products will be shown up right on the grouped product page. Additionally, Magento 2 Grouped Product Custom Options extension supports updating dynamic prices based on selected custom options of individual simple products on a grouped product page. It means the prices of options will be calculated to the price of the simple product. In the admin panel, store owners can configure to show or hide the image of products as wish for better performance of each product. Moreover, buyers always want to see items’ photo, so this feature of Magento 2 Grouped Product Custom Options extension is totally essential for a wonderful display. Using Grouped Product Custom Options extension, from the Magento 2 backend, with simple products which are visible on catalog, admin can set up to turn on product URLs, so that customers can click into images of these associated items to go to product pages directly. The default of Magento 2 is unable to show custom options of products on grouped product pages. Whereas, using Magento 2 Grouped Product Custom Options Extension, customers can choose configurable products and simple products with options right on grouped product pages. That totally brings convenience to online buyers when they can select options directly on a grouped product page as wish. Moreover, the more conveniently they purchase, the more items they buy. As mentioned above, Magento default does not allow admin to add associated products with custom options to a grouped product page. Meanwhile, installing Magento 2 Grouped Product Custom Options extension, it will bring store owners a great chance to group simple products with custom options and configurable products flexibly as wish. Good module with helpful support team! Not only Magento 2 Grouped Product With Custom Options extension saves me tons of time to assign unlimited simple and configurable items, but your Support Team is also helpful with quick and reliable response and update. I'll come back for more extensions. If you use grouped products for your store; I highly recommend this module! Work well and enthusiastic support. I like this plugin for grouped products. I wish if you had more extensions for grouped products. Thank support team a lot. This module is what I need. I highly recommend using Grouped Product with Custom Options for Magento 2 extension if your product type is grouped product. It is pretty helpful. This Magento 2 Grouped Product with Custom Options does exactly as described. Even though we have a little problem with setting up but support team helps us to solve most immediately. It's worth having this extension. 5 stars for this module and for your support team. The module is simple but great useful and work smoothly. The support team is enthusiastic! When I try its demo, I myself want to order this set of clothes. I really like this module because of its nice visual and useful features. I clicked Add to cart button without hesitation.